Railpictures.ca - Dave Burroughs Photo: Notice in this picture class leader MLW FA-1 CN 9400 which has been preserved at the Canadian Railway Museum at St. Constant. The trailing unit is CN 6805 which has been relegated to freight service as she finishes out her final days of service. 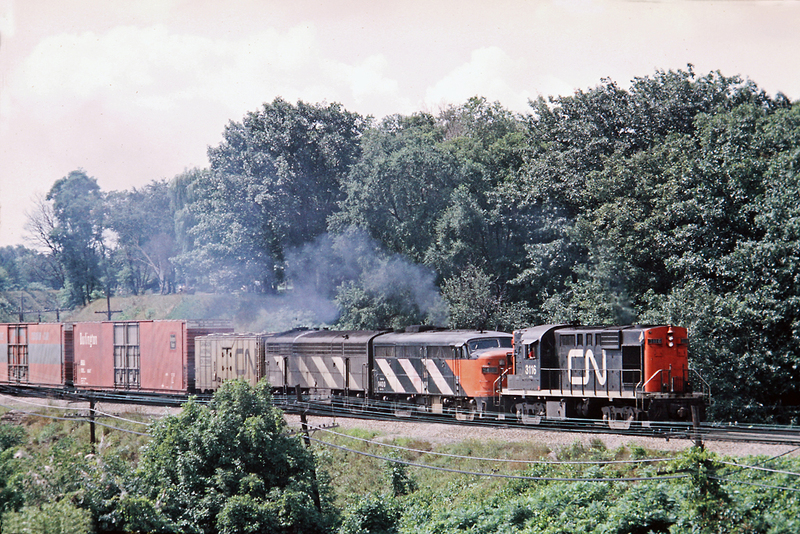 Also getting rare by this time is the CN reefer painted in gray and Burlington Route high cube car. | Railpictures.ca – Canadian Railway Photography – photographie ferroviaire Canadienne. Caption: Notice in this picture class leader MLW FA-1 CN 9400 which has been preserved at the Canadian Railway Museum at St. Constant. The trailing unit is CN 6805 which has been relegated to freight service as she finishes out her final days of service. Also getting rare by this time is the CN reefer painted in gray and Burlington Route high cube car. I don’t know what’s more interesting, the FA-1 in zebra stripes, the FM B-unit, or the Burlington hi-cube; superb shot Dave! Quite an oddball lashup for sure! And get a load of the size of that reefer compared to the “modern” hi-cube 86′ers!